After the failure of the July Offensive on the Eastern Front, Alexander Kerensky, the new prime minister, replaced General Alexei Brusilov with General Lavr Kornilov, as Supreme Commander of the Russian Army. 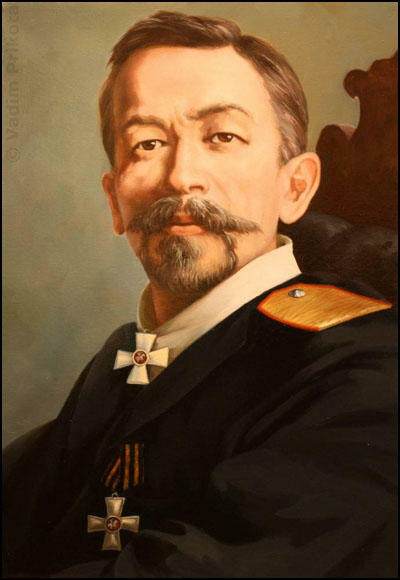 Kornilov had a fine military record and unlike most of the Russian senior officers, came from a poor family. "This combination made Kornilov the man of destiny in the eyes of those conservative and moderate politicians... who hoped that through him the Revolution might be tamed. But not only the right pinned its hopes on Kornilov. Kerensky and some in in his entourage hoped to use the general to destroy any future Bolshevik threat and to remove or diminish the tutelage of the soviets over the Provisional Government." However, the two men soon clashed about military policy. Kornilov wanted Kerensky to restore the death-penalty for soldiers and to militarize the factories. He told his aide-de-camp, that "the time had come to hang the German agents and spies, headed by Lenin, to disperse the Soviet of Workers' and Soldiers' Deputies so that it can never reassemble." On 7th September, Kornilov demanded the resignation of the Cabinet and the surrender of all military and civil authority to the Commander in Chief. Kerensky responded by dismissing Kornilov from office and ordering him back to Petrograd. Kornilov now sent troops under the leadership of General Aleksandr Krymov to take control of Petrograd. Kornilov believed that he was going to become military dictator of Russia. This became known as the Kornilov Revolt. He had the open support of a number of prominent Russian industrialists, headed by Aleksei Putilov, owner of the steelworks and the leading Petrograd banker. Others involved in the plot included Alexander Guchkov, a backer of an organization called the Union for Economic Revival of Russia. According to one source these industrialists had raised 4 million rubles for Kornilov's conspiracy. 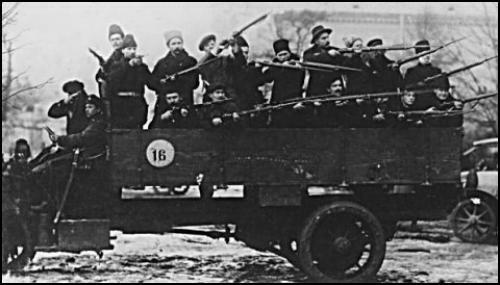 At the time of the overthrow of the Tsar the people and the soldiers on the streets were not well organized. It was the leaders of the duma (the weak parliament which Nicholas II had allowed) who took the initiative. They were mainly liberal aristocrats like their first leader, Prince Lvov, or middle-class men like Kerensky who became minister of justice. They declared themselves to be the `provisional' (or temporary) government of Russia. They promised to rule until an assembly elected by the people could decide on a new democratic system of government. However, they were not anxious to fulfil this promise quickly and gave as an excuse that a time of war and chaos was not suitable for elections. On 29th June Kerensky, as Minister of War, called on the officers and soldiers of the Russian Army to strike hard at the enemy in a grand offensive on the south-western front; the Central Executive Committee of the Soviets supported Kerensky with an appeal to the armed forces. The main purpose of the drive was to force the Germans to return to the Russian front the divisions which they had diverted to France in preparation for an all-out offensive against the Western Allies. At the same time, the Provisional Government hoped this move would restore the fighting spirit of the Russian Army. The new Commander-in-Chief was the popular hero, General Lavr Kornilov. Kerensky wanted him to be ready to deal with any new trouble from the Bolsheviks, but Kornilov decided that the time had come to replace Kerensky with a new dictatorship under himself. Kornilov thought Kerensky too weak and too socialist to be worth protecting. In the last week of August he began to march on the capital. Kerensky's position was desperate and he was forced to call on the support of the left-wing groups, including the Bolsheviks, to save him. The imprisoned Bolshevik leaders were freed and arms handed over to them. (Source 6) In his book My Reminiscences of the Russian Revolution, the journalist, Morgan Philips Price described General Lavr Kornilov making a speech in Moscow on 25th August, 1917. A wiry little little man with strong Tartar features. He wore a general's full-dress uniform with a sword and red-striped trousers. His speech was begun in a blunt soldierly manner by a declaration that he had nothing to do with politics. He had come there, he said, to tell the truth about the condition of the Russian army. Discipline had simply ceased to exist. The army was becoming nothing more than a rabble. Soldiers stole the property, not only of the State, but also of private citizens, and scoured the country plundering and terrorizing. The Russian army was becoming a greater danger to the peaceful population of the western provinces than any invading German army could be. 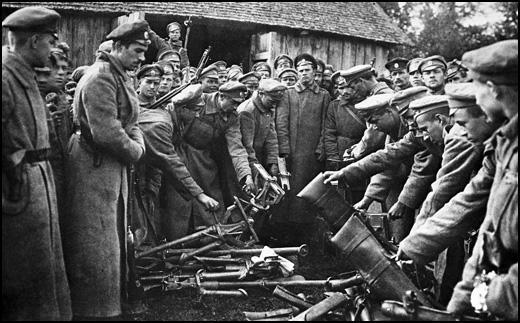 In September there was an attempt at a coup d'etat by the commander-in-chief, General Kornilov, which was defeated, not by Kerensky and his government, but by the rank-and-file workers and soldiers in and around Petrograd, whom the Bolsheviks, through the Soviets, swung into action against Kornilov. The railway workers stopped his trains, the telegraph operators stopped his messages. The Cadet leader Milyukov, summed the situation up accurately when he said: "For a short time the choice was free between Kornilov and Lenin.... Driven by a sort of instinct the masses - for it was with the masses that the decision lay - pronounced for Lenin." Everyone knew that the Bolsheviks had saved Petrograd from Kornilov: their prestige gained enormously. It was the first occasion on which the "soviet" parties had collaborated, and as a consequence strong opposition wings began to appear within the Menshevik and S.R. parties which wished to break with the Cadets and work with the Bolsheviks. The Petrograd and Moscow Soviets gained new vigour and energy, and succeeded in evading Kerensky's order to disband the military detachments which they had formed against Kornilov. Kerensky, had appointed as Commander-in-Chief of the Army a general of peasant origin named Kornilov. Kornilov declared that he could not take responsibility for holding the front against the Germans unless measures were taken to restore discipline in the army and curb the powers of the soldiers' committees. At first Kerensky agreed to his proposals, but then became suspicious of his intentions and denounced him as a counterrevolutionary. Kerensky, now Prime Minister of the Provisional Government, toys with a 'Napoleonic' plot to seize Petrograd. At the last minute Kerensky gets cold feet and abandons the plot. Kornilov's military uprising was defeated in a few days by the workers and soldiers of the Petrograd Soviet - thanks to the assistance of the Bolshevik party... which was still being suppressed and persecuted by the government! General Krymov, who led the advance-guard against the Soviet, committed suicide. His fellow-conspiritors - Kornilov himself, Lukomsky, his aide-decamp, Kaledin, of the Don Cossacks - were all taken prisoner, but not harshly treated.... The men on horseback had failed. The Kornilov movement, such as it was, ended in fiasco, without bloodshed. Kerensky and his Cabinet were still, officially, in power. But there had been a striking change in the mood throughout the country. The Bolsheviks could now claim to have been the leaders in the `victory over the counterrevolution', and their power and influence rapidly increased. Trotsky was let out of prison and took his place in the Petrograd Soviet. On 13th September the Soviet, for the first time, showed a majority for a resolution proposed by the Bolsheviks. A few days later the Moscow Soviet did the same. 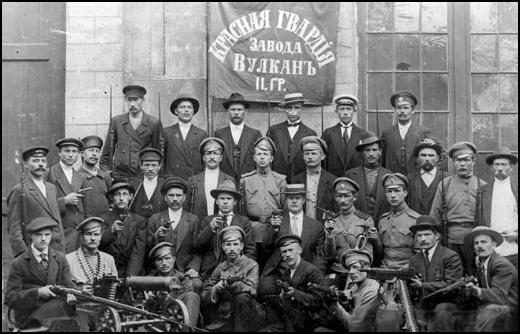 In Petrograd the Bolsheviks had now many thousands of well-armed Red Guards, and when the authorities asked for the rifles to be returned to the Government arsenals the Red Guards refused to give them up. The Kornilov Affair has intensified mutual distrust and completed the work of destruction. The Government is shadowy and unreal, and what personality it had has disappeared before the menace of the Democratic Assembly. Whatever power there is again concentrated in the hands of the Soviets, and, as always happens when the Soviets secure a monopoly of power, the influence of the Bolsheviks has increased enormously. Kerensky has returned from Headquarters, but his prestige has declined, and he is not actively supported either by the right or by the left. Question 1: Study sources 2 and 3 and explain why large numbers of the people in Russia were not happy about the policies of the Provisional Government? Question 2: Give reasons why Kornilov and other senior officers felt so hostile towards the Russian Revolution? Question 3: Select passages from this unit that help to explain the view expressed in source 10 that Kerensky changed his mind about using Kornilov to deal with the Bolsheviks. Question 4: How did the Kornilov Revolt work to the advantage of the Bolsheviks?